Best Odds Guaranteed is a nice extra profit you will make from horse racing refund offers! How do you benefit when matched betting? How can you check your BOG winnings? Could you just focus on BOG? Most bookies run a promotion called “Best Odds Guaranteed” for horse racing, and it can be very profitable to matched bettors. Odds for horses do not stay still, and they go up and down continuously. If you place a bookmaker bet on a horse, and if the starting price (the odds of a horse right at the start of the race) of your horse is higher, the bookie will pay you out at the increased odds if your horse wins! If you place a bookmaker bet on a horse at odds of 4.0, and if the starting price of the horse is 6.0, your bookmaker bet will be settled at 6.0 odds instead of 4.0! However, if the starting price of your horse has dropped, the bookie will not change anything and still pay you out at the odds you bet the horse on. 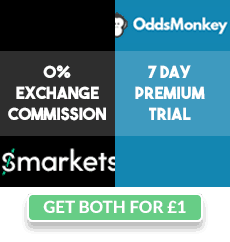 This can mean extra profits for matched bettors, as there is no “Best Odds Guaranteed” promotion on the exchange. This means that when we lay our bets, we will lose the same amount of money regardless of the starting price of the horse we’re laying. If the starting price for the horse goes up to 3.0, the bookie will pay you £20 profit instead of £10 because of Best Odds Guaranteed. However, you still lose the same £10 at the exchange. 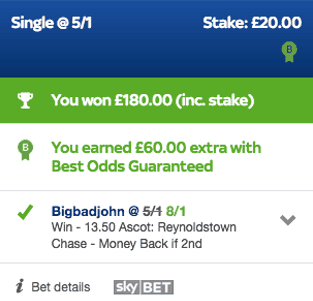 So overall, you have made a £10 net profit from placing this qualifying bet! Plenty of bookies do the Best Odds Guaranteed on their horse racing. Coral, Skybet, Ladbrokes, Betway, Bet365, Williamhill, Betfair Sportsbook, Betfred, Betvictor, Paddypower, Stanjames, 888sport and many more. You don’t have to opt in to anything to qualify for Best Odds Guaranteed. Just place a bet on a horse race and you’re qualified. However, note that Best Odds Guaranteed only qualifies for horse races in the UK and Ireland, and will not qualify for races in any other places. How Can You Check BOG Winnings? It’s easy to find out if you have won extra money from Best Odds Guaranteed. The bookie will normally state the extra money you have won in your settled bets. An example is shown in this screenshot from Skybet. In the above example, my £20 back stake was placed at odds of 6.0 but the starting price odds were 9.0. Therefore, rather than a £120 payout, I received £180 payout! Some bookies have a limit on how much you get win with Best Odds Guaranteed, but these limits are usually very high and should not worry you. For an example, Betway has a limit of £5,000, and Skybet has a £50,000 limit. Best Odds Guaranteed should be just a nice bonus on top of doing other horse racing refund offers. Aiming for Best Odds Guaranteed is hard because the favourite in the race (the most likely to win) normally have their odds go down instead of up, which would not qualify you for a Best Odds Guaranteed bonus. If the odds of a horse go up, qualifying you for a Best Odds Guaranteed, it normally means that the chances of that horse winning are getting lower. Best Odds Guaranteed are hard to hit if we place our bets 5-10 minutes before a race, as the odds will probably not move by too much anymore. However, if we placed our bets 3-4 hours before the race, it is more likely that the odds will have moved significantly by the time the races start, hopefully leading to an improved starting price. On Saturday mornings or any other ITV Racing day, try to search for close matches for ITV Racing offers, and try to place your bets early if possible. This will increase your chances of getting Best Odds Guaranteed bonus winnings. Facebook Group - Ask 15,000+ fellow matched bettors (including me!) any questions you have. Join the Group!